← Blackheath Road, London. July 2002. This 200-foot-long sinkhole on Ocean Park Boulevard in Santa Monica, was caused by a broken water main, closed the road Sunday for several blocks, authorities said. The 12-inch pipe broke about 8:30pm Saturday night, washing away soil and causing the boulevard to collapse between Euclid and 14th streets, Santa Monica Police Sgt. Dan Salerno said. 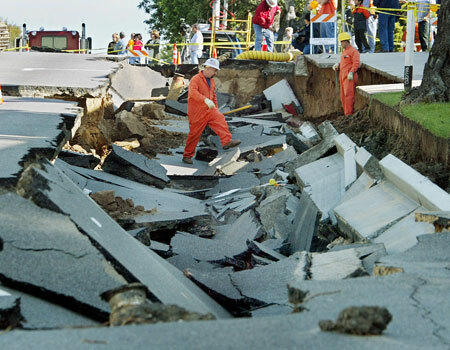 This entry was posted in Pictures and tagged CA, Santa Monica, sinkhole. Bookmark the permalink.